Reposting due to SactoMoFo. Original date 7/28/10. Here's a question for you. Why is it that the state capitol of one of the most progressive and forward thinking states in the U.S. is so backward when it comes to the hottest food trend in the country - gourmet food trucks? The last two weeks I've gotten to enjoy the variety of food trucks and other street foods in two of the biggest street food cities in the U.S. - Portland and San Francisco. Let's start by looking a little bit at these two cities before we look at our own. Portland has become known for its street food due to its over 400 licensed street food vendors. As I showed in my post earlier this month, even as many as 22 on one street block! It recently went head to head with New York City to claim best street food. (See referenced articles at end.) Definitely it has a lot of variety and some very well known trucks featured nationally on Vendr.tv, a video blog for street food, and other national networks and publications. The reason there are so many is that Portland welcomes them. In an interview with Vendr.tv, Portland Mayor Sam Adams explains that the city makes a point of welcoming street food vendors with easier permitting ordinances that still maintain integrity of health and safety concerns. 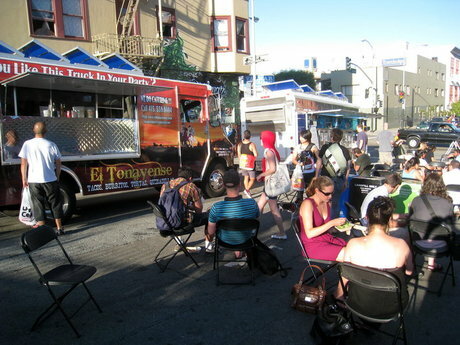 In July (2010) I had written about Off the Grid (OtG) in San Francisco. 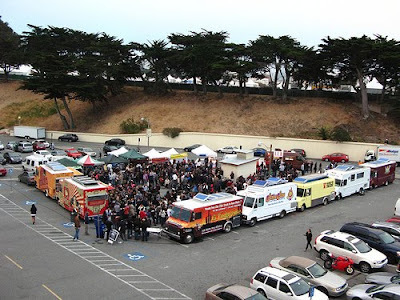 This is where a bunch of street food vendors congregate at Fort Mason every Friday night from 5-9. Each week the word of mouth grew and grew so that it now sees upward of 5,000 people a night. The success of Fort Mason allowed SF Cart Project’s Matt Cohen to open other locations. 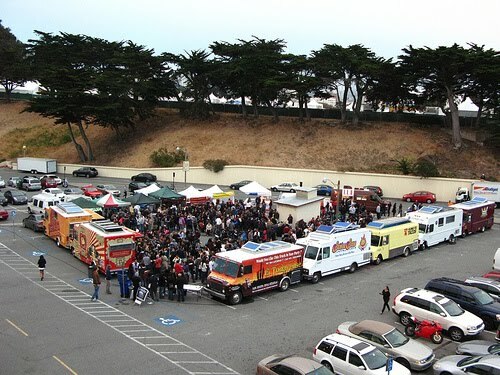 As of September 2012, Off the Grid now has events at over 20 locations throughout the Bay area. This last One location, McCoppin Hub, is the one we need to take note of because it becomes the first temporary mobile food ‘pod’ in San Francisco, modeled after the pods in Portland, Oregon. 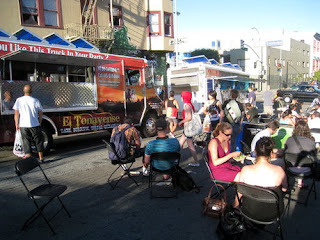 (New permanent pod, SOMA Streat Food Park, visited in this August 2012 post.) Mobile food pods are becoming an important consideration in the growth of street food popularity across America. Why? Because they revitalize neighborhoods! Formoli Bistro has been around for a few years. It has gotten quite a nice reputation during that time for fine food in a quaint setting. I finally checked it out for myself and find myself having mixed feelings. The first time I went was with a friend for lunch to try their famous Whiskey Burger. We heard that it was quite large and so we split it and a salad. Note that they have a $3 split charge on it, something I don't really care for. $3 to slice a burger in half? The burger was a hefty beef patty that is cooked to medium rare. It's juicy and full of flavor from the whiskey and the cheese. The burger is one of those items that has become so known that it will never be taken off Formoli's burger. It's popularity was obvious on my second visit when I went for dinner with a friend. She saw the burger arrive at the next table and couldn't resist. It looked so luciously juicy. As we waited for our orders, burger after burger was being delivered around us. In fact, I believe that at each table at least one of the people had ordered the burger. But when our meals came out, the burger that was set in front my friend was obviously overcooked. The outside was crunchy, the thickness was thinner from the overcooking, and when she cut into it there was no pinkness like all those other burgers we had just seen. We somehow got a lemon burger! The wait staff did offer to remake it but my friend was hungry and wasn't patient enough to wait. At least they did take the burger completely off the bill. I had been so enticed by the many delicious sounding offerings on the menu that I decided the best thing to do was to get two small plates versus an entree. I chose the sweetbreads and the poutine and, although delicious, was a bit disappointed in both. First, the sweetbreads. The first time I had sweetbreads was at the Waterboy. Since then I pretty much judge all against theirs. Although both Waterboy and Formoli's price at the $13 mark, Waterboy serves a large, full plate versus the plate I got at Formoli's with two small sweetbreads on a bed of white beans. Although Formoli's was delicious and the white beans were a nice complement, I still felt shortchanged on the amount of sweetbreads on my plate. For preparation, sweetbreads have a membrane that has to be carefully removed by the chef before cooking. There was still some of the membrane on one of mine. So the dish tasted great, but lacked in value to me. My other choice was the poutine because it said it had a brie cream and mentioned braised short rib and pork belly in the description. Therefore, I had some expectations. Poutine is popular in the Montreal, Canada area where it is French fries with cheese curds and gravy. I was expecting French fries with the brie cream in place of the curds and then a gravy with some meat in it. Turns out the beef and pork belly were cooked into the sauce, according to the waiter. Thus the lack of any trace of meat on my fries. But the brie cream sauce/gravy was delicious. Again, a successful dish flavorwise. I just think that it would take another step to awesomeness if it had some bits of meat. I realized one should not compare a dish to one you had somewhere else, but it just can't be helped. In the case of the poutine, my first experience had been at Kupro's, where they have a gravy full of bits of short rib over their fries. So when I saw short rib beef and pork belly mentioned on the Formoli's description, a similar image/expectation was formed in my head. All in all, I think the dishes have all been well made and flavorful. There were several dishes on the menu that it was hard to decide what to choose. I've always had wonderful, friendly service from the wait staff as well . I just had several disappointments in regards to value and expectations. Most of you know that I'm one of the organizers of SactoMoFo (Sacramento Mobile Food Festival). As we get closer and closer, (10 days to go) it is no wonder that my mind is on pretty much nothing else. Suffice it to say, I'm not guaranteeing any Crockpot Wednesday next week. We will be on a week's run of publicity up to the event. Honestly, as much as I'm championing the food trucks, I'm about food trucked out for a while. But I'm giving you a two-fer this week anyway. Problem is, with one crockpot, it takes two separate days to make them. First up is Mexican style brown rice. I decided to use some more of the rice that the California Rice Commission sent me to do another dish. As I mentioned last week, rice does best when it is done on high setting for only 2-3 hours. It is also very important that you pour in boiling, already hot water. You cannot start rice in a crockpot from cold water, it doesn't come out well because it takes forever for the water to heat up. This rice is simple and has few ingredients. It’s always interesting to see the family traditions every family has. In this case it’s my BFF’s husband’s. His family has been in Sacramento for many decades. I’m not sure when they first arrived, but this particular story goes back to the 30’s, so they arrived before that. If you ever go to Tres Hermanas to eat on K Street, that property still belongs to them. When BFF started dating him, he lived in the upstairs unit. Turns out the family used to run a bakery long ago where the restaurant now is. 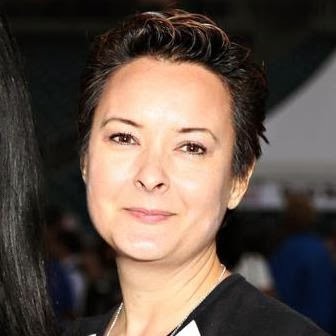 Last Wednesday I had the honor of being a panelist on the subject of Food Writing for Table Talk, an event put on by the Sacramento Press and the Sacramento Bee. I, obviously, represented food bloggers, there was an Elite Yelper, Micah, and also Niesha Lofing, staff writer for the Bee. Towards the end of the panel we got into a little discussion on advertising, whether you make money at blogging, and how do you handle getting freebies and does it bias what you write. Anyone who has read my blog a few times knows that I am very open about any of my sponsorships, getting freebies, etc. For one thing, there is now an FCC rule that we must disclose when we write about something that we might have received a deal on. Besides that, though, I've got nothing to hide. Here are a few examples of how I handled it. 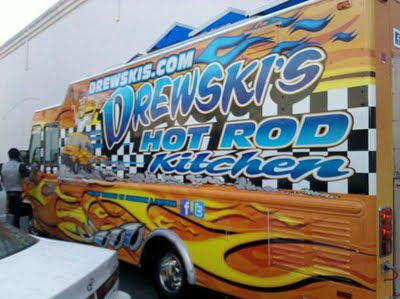 Last weekend I did a quickie mention of Drewski’s Hot RodKitchen in my post, Let’s Talk Sandwiches. At the time I didn’t feel like I could give them a fair full page review from just one sandwich. I did talk to Drew about his launch, SactoMoFo, and that he should make a stop at CalPERS. After all, once Mini-burger stopped by like I asked, they ended up putting us on their weekly schedule. Wednesday Drewski’s tweeted they were heading our way. Even though I brought my lunch and we’re getting to my traditionally poor end of the month (damn State monthly paychecks), I had to hit the ATM for some cash and was promptly parked by the truck as Drew pulled up. He recognized me from Saturday and said they had listened to my suggestions. They insisted I try the tweaked version on the house. But I also wanted to try a different sandwich and the tots as well. I was able to watch over the last six weeks as the new Freshii underwent construction at the CalPERS building. The new location at 3rd and Q had originally been slated to open April 4th, but got delayed by construction and permits. (Doesn’t all construction?) Owner Eric Heffel had assured me such a quick turnaround was possible. The Folsom location got done in four. I wished him luck. Last week I questioned him again. At that point it was a day by day approach. Finally on Thursday they were at a point where they could start training employees as construction continued around them. It was kinda chaotic. Sunday was the VIP event for friends and family. Being a punctual girl, I showed up shortly after 11 to find a frazzled Eric. They had been up til midnight cleaning the place of construction materials to get ready for the morning. I enjoyed my meal with Sacatomato’s Ann and her family. We did find a couple things that needed work. 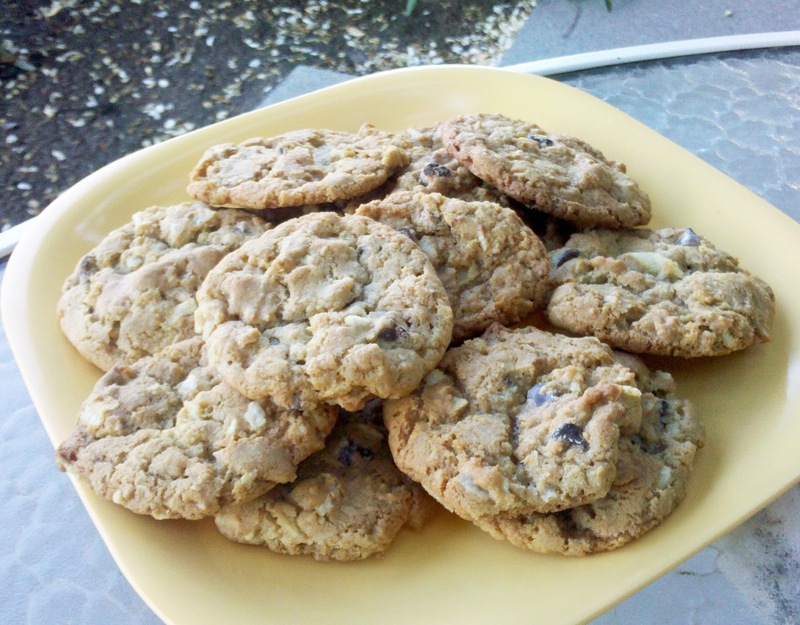 Eric whisked them away to the kitchen. It was practice day for his staff and everything needed to be given the critical eye. He even went so far to tweet that there was free food on Sunday to help them practice some more. Last month there were the sandwich lists in both Midtown Monthly and Sactown Magazine. I was disappointed that my favorite was missed on one, but everyone has different tastes. Today I thought I'd share three recent sandwich experiences I've had. Lobster rolls have been having their day in the sun lately. They are the trend sandwich in that they are being added to more and more restaurant menus. 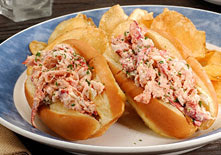 Akin to a crab salad sandwich, lobster rolls are bits of lobster tossed with a dressing and some grated vegetables and stuffed into a roll. Nothing so different or unusual there. I had one of my cards for Red Lobster and decided to grab an order to-go on the way to a movie screening. A few people know that I actually grew up in the Middle East. I'm an oil brat. My dad's an engineer and so for 16 years we lived in Saudi Arabia. This is how I got to travel the world. I thank my dad often for that opportunity - in my head. I'm now realizing that I probably have never actually told my dad that. I'll have to remedy that. It's this travel that has made me the foodie that I am. I am willing to try a lot of things. Just yesterday I tried jellyfish for the first time. Although not horrible, I think I can live without it. I also like spice. Don't give me a bland dish. I want flavor. Lentils and beans can be rather flavorless, but are easy enough to doctor up with veggies, broth, and a pinch or two of spices. I knew that this week I wanted to do a lentil soup, but I didn't want something boring. Give me a bit of zing. This is adapted from a Moroccan lentil soup. Throw in some cinnamon, cumin, and nutmeg and you've got something more exotic. Sometimes life just swamps you. 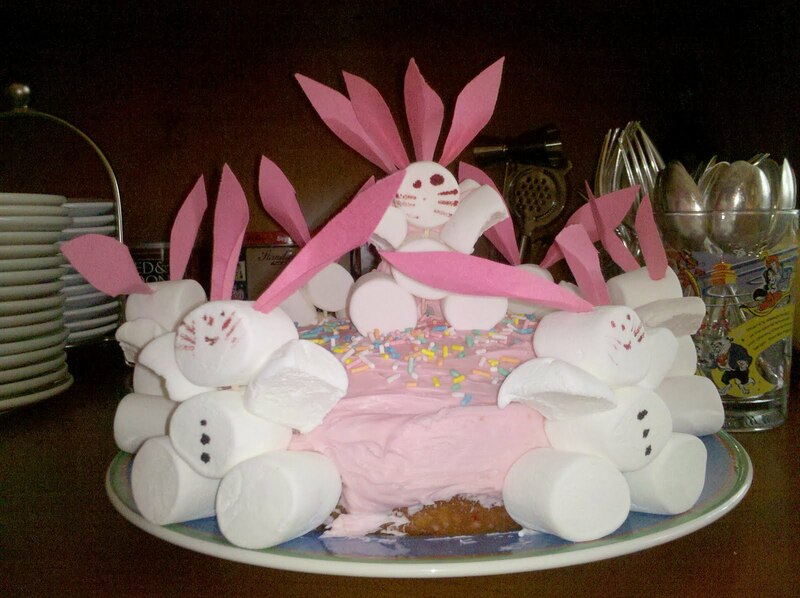 Last week's Online (Bake) Sale for Japan was a 'spur of the moment' idea that gathered steam and became really great. Then I've got final details going on for SactoMoFo - the Sacramento Mobile Food Festival for which I'm one of the organizers. Busy, busy, busy. Yet there's also the need to keep things interesting on the blog and not let it be neglected. Thus the boring picture above. In a perfect world I would have a picture of a lovely pork loin with the jam on top. Or perhaps a delightful onion potato tart or a scrumptious panini featuring the jam. All of these are great things to use the onion jam on. It's very versatile. But I haven't had the time to do any of those great ideas and have been sitting on this onion jam post for weeks. I had to just shrug my shoulders and go with the simple picture. When Paul made the onion jam last year at our canning party it pretty much fumigated my small house. I think it was about 20 pounds of onions that he sliced up that day. Talk about crying eyes. 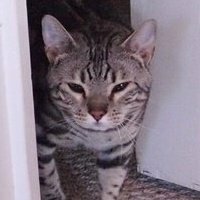 Here is Star coming out of my bedroom saying, "What is going on out here? My eyes sting!" All that slaving at the stove that day and he only got about 6 quarts of onion jam. We each got one and it was like gold in a jar. We had a rather crude nickname for the stuff that day that we shortened down to code - FF Onion Jam. It's also been recently renamed as Tourettes jam among my foodie friends. Whatever you call it, it's damn good.